This week the temperatures are finally rising. Yesterday, I even wore my new bikini to Bains des Paquis and got a little tan. Some people, brave ones, were even swimming in the Lake. 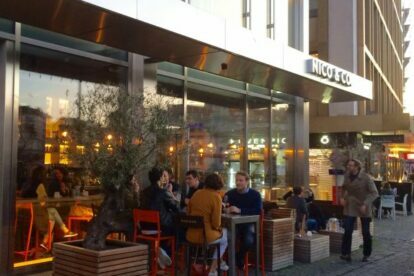 When the sun is out, the best terrace to drink a “Piscine de Rosé” (in French in the text) is at Nico & Co. The wine selection is good and the wine by the glass is cheaper than in other similar Geneva establishments. The location right on the lake is stunning. Nico & Co. is the place to see and be seen after work with your cool new shades. It is where you go to soak up the last rays of the sun for the day, feeling its warmth slowly fading on your skin while sipping rosé (even though their spritz is really good too) and laughing with your beautiful friends and coworkers. Inside, the décor is trendy, very Manhattan, yet small. It is truly an outdoor place. They have good cold cuts and cheese plates in case you have the munchies after drinking too much wine. Nico & Co. is the place to live the good life and be merry! Yes, there is life after work!